This is about managing and stimulating your cat or dog while you are away. A lot of people have difficulties in managing their cats because they are away a lot. Perhaps these people feel a little guilty. I used to. I am retired now so spend all day with my cat. He loves that! I can manage him closely and keep him settled and dieted. I think one problem people might have in managing the diet of their cats is ensuring that their cat receives a steady but limited supply of food. If you are away all day all you can do it put down a decent amount of dry cat food. Dry cat food in large quantities is not good for a cat. It can lead to health problems such as diabetes, obesity and urinary tract problems such as cystitis. Also being away a lot can cause stress in the cat which also promotes urinary tract problems. After that lengthy introduction I'd like to write about something brand new and in fact unique. It is not yet on the market but a smart IT guy in Wales, UK, has built a very sophisticated device that allows him to feed his dog via a Twitter Tweet. 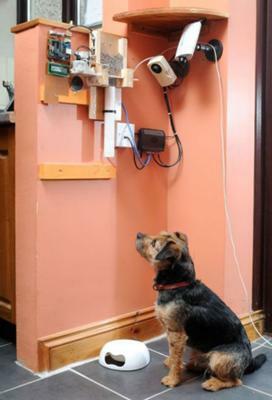 The device also allows him to watch his dog feeding. Nat Morris sends a tweet to his device from work. The mini computer he built sets off a buzzer that alerts his dog, Toby. Toby attends the feeding station. The computer then sends a signal to a motor that opens a trap door releasing food to a bowl. An online camera allows Nat to keep an eye on things. Well, I love this. It has lots of potential for feeding cats. Cats are trainable especially when the reward is food. I can't see any reason why the device can't also provide other things that a cat might need. It might activate another device that is a toy for a cat for example. Perhaps the cat obesity epidemic that we read about in the United States might in part be due to absent owners putting down too much dry cat food while they are away. Perhaps Nat's device might go some way to arresting that unwelcome trend. Another benefit is that the cat's owner could see what his or her cat is doing if the device could be extended to cover more than one camera. This is reassuring for the human caretaker. See an original version of this story. Love what you do Marc. When I was working I always felt a bit unsettled being away so long from my lady cat. What you do would have helped a lot. Smart. I never even thought of it. Mind you at that time computers and phones where not as advanced. There seems to be more and more possibilities these days. I have a spare laptop at home with a built in webcam. I leave it on with the camera aimed where i want it and i open a skype account on the laptop before i go to work. I have set the skype preferences to automatically answer any call, and I have set it to automatically start video when on a call. The result is that i can call from work and see whats going on at home whenever i want, and even talk to my cats if i really want to. The latter part works better when there is nobody else in my office at that particular moment 🙂 I can also check in on them through skype on my phone from wherever i am. Its very simple and very effective. None of this security cam software etc. Just a skype call. And I want to get hole of another webcam which I will attach to my desktop comp, so I have the option of another view, using a third skype account. Shame i dont know how to make a conference call so i can be seeing through both cams at the same time. There has to be a way. Anyway, I am sort of addicted to being able to see my cats. I feel much better being able to check in on them. They are able to go in and out as they please, but i see plenty of them through the day. They are young and eat 85% wet food, and are fine with the rythm I feed them, no over eating or weight issues yet. But when they get a bit older I am sure being able to control remotely the amount of food they receive will become a more interesting possibility. Now that i have my simple system its totally normal to me to be able to see them. Some might think it a little extreme but its no different to having a baby monitor i guess.